The Attic is the place to stay in Auckland! The staff is amazing (especially beautiful Ira 😉) and the bathroom and kitchen are huge and clean. The location is so good with cool bars/clubs (cassette 6 and bar 101) close by and the SkyBus stopping in front of the hostel. The Indian restaurant next door has delicious food! It’s so easy to meet people here as a solo traveller - I met the most amazing travellers here ❤️. Everything was amazing and in the end I stayed waaaay too long, haha! This place is a great choice if you’re in Auckland. The location is right next to queen street with a bus stop in front of the entrance. The rooms are being well taken care of and the beds are comfortable for a hostel. 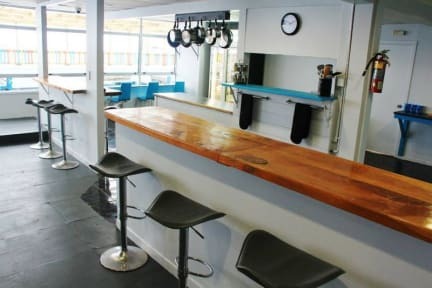 Especially the balcony next to the kitchen with a chill room and tv room right besides it make it easy for people to get to know each other, so there’s a great social atmosphere. Also the staff members get along with everyone. So thanks guys you’re awesome! Attic backpackers has the perfect location. Staff is friendly and I’ve met awesome people over there. Everything is pretty okay, kitchen was not the cleanest. Nice place in the center of the city, friendly staff and a good atmosphere. Small tip; mabye a small shelf next to the bed for your phone or in my case: glasses. And change those bunkbeds. When somebody moves in bed the whole thing moves and squeaks :). Great place to stay after arriving in New Zealand. Facilities are Nice and clean. They had a Nice roof terrace to sit. Unfortunately they lock the kitchen during the night. They said it would be open at 7am. When i had to leave at 7.30 the kitchen Still wasnt open so I had to leave my food behind. Bit of an unsocial vibe due to longstayers. But very central, clean, good kitchen and friendly staff.